It’s been very dry recently; just 30mm of rain fell in January rather less than the average of 81mm. 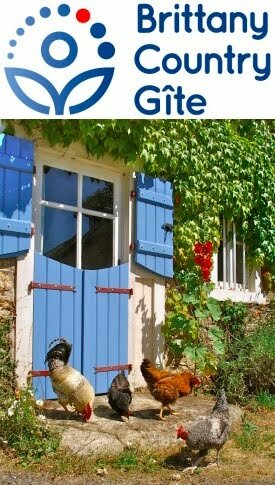 It has meant that we’ve been able to work outside a lot though and we’re making progress with the gite garden. 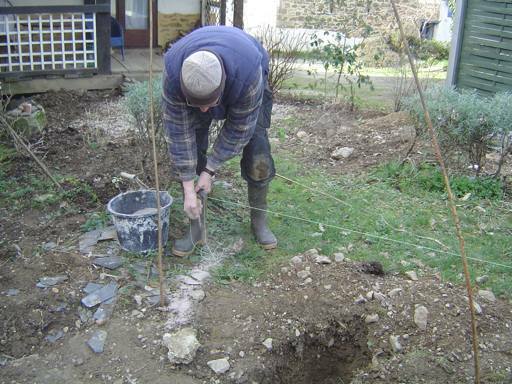 The photo shows me using some wood ash (it was just what was to hand, sand would be just as good) and a length of string to mark out a curved bed, transferring the plan to the actual garden. It’s an interesting stage as, despite all the care and consideration that went into the planning, once it’s actually marked out in full scale in the garden itself, the proportions might seem wrong or the size for a particular item either too big or too small. And how did we deal with the concrete hard standing I told you about at the end of the lasts blog? I dug around and marked its limits with some canes, then measured up and transferred them to the plan, as an overlay on tracing paper (actually, it was greaseproof cooking paper) and we reconsidered the placing of certain features. As we were keen on our original design, one solution might have been to hire a digger and driver to remove it all and then cart it down to the tip but that’s not a permaculture approach. Neither did it seem particularly “permaculture” to spend a lot of time digging up bits of it to place beds where we’d planned and then mixing concrete to form paths where there was good soil. A couple of things inspired us: an article in Permaculture Magazine issue 48 and an innovative reclamation of an old industrial site here in Brittany. So, without too much disruption, we’ve modified our plan and where we really want plants where the concrete is, we’ll smash a few drainage holes with a pickaxe, then put raised beds on top. Another part of the concrete slab will be home to a barbeque made from one of two old oil drums given to us by our French dairy farming friend, Yves (the other is going to be converted into a charcoal burner) and a cob pizza oven. Most of the path now runs over the concrete and there’s just a little to break up where we want to plant a living willow structure. I have also seen people break it up then put it back together like patio stones---planting thymes and things in between. Looks good after the plants fill in. We have also seen people use it for retaining walls and stack it for garden beds. No need to haul it somewhere that's for sure. By the way---we eventually have a big slab of our own to do something with. It has heaved and causes rain water to get into our garage side door---so out it must come and be made into a new patio across the yard. Good luck!